A method of fabrication in which a parison (hollow tube) is placed between the two halves of a mold (cavity), and forced to assume the shape of that mold cavity by use of air pressure. The total amount of volume inside the container. The plastic forming the opening of a container shaped to accommodate a specific closure. The plain portion of a decorated container set up for application of labels. The cavity or matrix into which the plastic composition is placed and from which it takes its form. A mark on a molding or casting where the two halves of the mold meet in closing. Any of a class of solid or semi-solid organic products of natural or synthetic origin, generally of high molecular weight with no definite melting point. 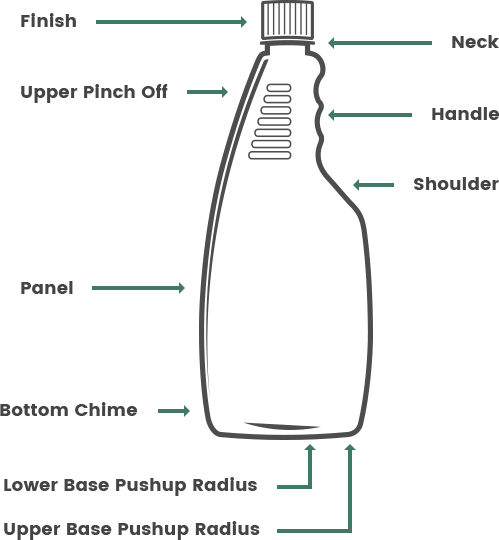 Creates the path by which product is conveyed from the bottle to the sprayer. Prevents leakage of product by providing a conformable seal between the sprayer and bottle finish. Regulates the stream or spray pattern of the sprayer and controls the sprayer shutoff. Creates compression on the inward stroke and vacuum on the return stroke. To prepare for operation by filling with a liquid. 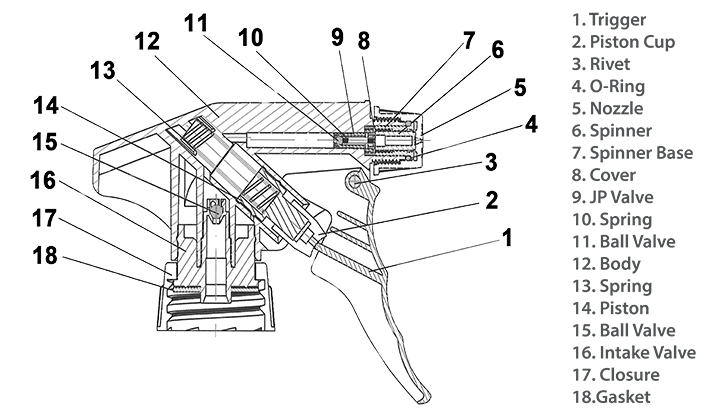 When discussing sprayers or pumps, “full prime” is reached when the sprayer or pump has expelled its first full discharge of liquid. Acts as a priming valve at the disk end, while the Spinner Face creates the turbulence necessary to create a circular spray or foam pattern. Provides the force necessary to return the trigger and all other sprayer parts to their original position on the return stroke, creating a vacuum. Provides an aesthetic, ergonomic cover for the sprayer. Provides the mechanical means by which energy is transferred to the pumping mechanisms within the sprayer. A device used to regulate the flow of liquid within a sprayer or pump. Delta offers a full range of bottle decorating options. Whatever your desired look, whatever your volume, we can recommend the application method most appropriate to your needs. We work with you to devise the optimum combination of run size and decorating method to ensure the best look for your budget and your needs. We even take care of converting your artwork into plates. Multiple Silk Screen lines offer cost efficient decoration resources in most small volume runs. Pressure sensitive application capabilities include a large variety of bottles and container sizes. Ideal for runs of 2500 to 500. Shrink sleeve application capabilities include a large variety of bottles and container sizes. Thermiage / Heat Transfer uses printing to decorate 3 dimensional plastic containers in full color process, halftone or line copy. Label copies are printed in multiple colors (plus one lacquer coat for adhesion) on a paper web. Using heat and pressure a Thermiage TM machine transfers the film-thin decorations from the paper web and applies them to the container in a permanent scuff resistant bond at speeds up to 100 per minute. We welcome your inquiries and look forward to consulting with you. What better way to enhance your marketing than to have your name, brand, or message on bottles that get repeated use and exposure by your target audience! Delta offers a full range of bagging and boxing options. Heat Seal Bagging lines package individual or multipack assembled products in clear or printed bags to your specifications. We have Custom Boxing lines. We can pack single items up to hundreds in a box. You tell us what you want. We work with you to devise the optimum combination of run size and packaging method to ensure the best cost for your needs. We welcome your inquiries and look forward to consulting with you. Delta offers a full range of Labeling options. We offer UPC and I 2 of 5 labeling. We offer Pressure Sensitive labeling, whether as bottle labels or as accessory labels. We can apply Neck Labels, with a wide array of shapes so that we can provide the look you desire. We can apply Hang Tag labels. Whatever your desired packaging, whatever your volume, we can recommend the labeling most appropriate to your needs. We work with you to devise the optimum combination of run size and labeling to ensure the best cost for your needs. The pad printing process is becoming more and more important to industrial applications every year. We welcome your inquiries and look forward to consulting with you.